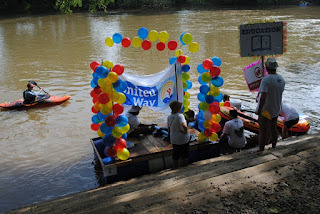 Registration is open for RiverLink's Anything That Floats Parade to be held on Saturday, August 8, 2015 on the French Broad River in Asheville. Join RiverLink for the wildest, wackiest event of the summer. Creating and building a raft, float or flotilla with fun-loving friends, family or co-workers is not only a grand excuse to hang out and play on the river, it's also a unique chance to have a blast while showcasing mind-blowing creativity in a friendly competition. Judges will select a winner in each of the four categories: 1. Most Creative - clever and imaginative, 2.Green Machine - best use of recycled and green materials, 3.Funniest - generates the most laughter and 4. Judge's Choice - overall best in parade.